Willy Wonka gave moviegoers their sugar fix for the weekend. "Charlie and the Chocolate Factory," starring Johnny Depp as candyman Wonka, had a sweet debut of $55.4 million, helping Hollywood make a dent in a box office downturn that has lingered for most of the year. Opening as a solid No. 2 was Owen Wilson and Vince Vaughn in the comedy "Wedding Crashers," which took in $32.2 million, according to studio estimates Sunday. The two new movies bumped the previous weekend's No. 1 flick, "Fantastic Four" to third place with $22.7 million, lifting its 10-day total to $100.1 million. Overall, business was up solidly, the second-straight weekend Hollywood revenues rose after a slump that had lasted since late February. After a slight uptick at the box office the previous weekend, the top 12 movies took in $151.4 million, a rise of 7.5 percent from the same weekend last year, when "I, Robot" premiered as the No. 1 movie. "It took two of America's favorite pastimes to turn things around, chocolate and weddings," said Paul Dergarabedian, president of box-office tracker Exhibitor Relations. "People are just waiting for the right kinds of movies to come along, and they will show up in big numbers." Director Tim Burton's "Charlie and the Chocolate Factory" is the second adaptation of Roald Dahl's beloved children's book, following Gene Wilder's 1971 version "Willy Wonka and the Chocolate Factory." For Depp, whose earlier collaborations with Burton include "Edward Scissorhands" and "Ed Wood," "Charlie" marked his biggest opening ever, surpassing the $46.6 million debut for his 2003 blockbuster "Pirates of the Caribbean: The Curse of the Black Pearl." 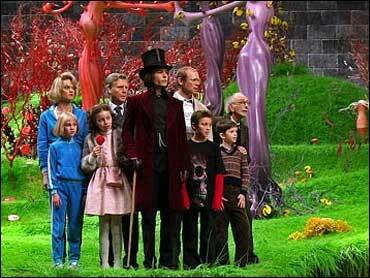 The movie received high marks from critics for Burton's fanciful visuals and Depp's quirky rendition of the anti-social Wonka, backed by a roster that includes Freddie Highmore, Helena Bonham Carter, Noah Taylor and James Fox. "I just think they work so well together," said Dan Fellman, head of distribution for Warner Bros., the studio behind "Charlie and the Chocolate Factory" and the Burton-Depp animated collaboration, "Corpse Bride," which is debuting in September. "It's a great chemistry they create, Tim with his imagination, Johnny and a great cast." While "Charlie and the Chocolate Factory" locked up the family audience, the R-rated "Wedding Crashers" gave adult crowds a dose of raunchier humor, with spicy language and sexual situations. The movie stars Wilson and Vaughn as men who crash strangers' weddings to pick up women. Distributor New Line had briefly mulled whether to tone the movie down to a PG-13 rating, but test audiences gave the racy film a thumbs up, said Russell Schwartz, the studio's head of marketing. "There's been such a move toward more sanitized movies, so I think the R rating actually helped," Schwartz said. "And it's not a hard R. I think it of more as soft R. It's a movie that wears the R on its sleeve very proudly." "Charlie and the Chocolate Factory," $55.4 million. "War of the Worlds," $15 million. "Mr. and Mrs. Smith," $5.05 million. "Herbie: Fully Loaded," $3.4 million.